There’s something old-fashioned about quince. It could be partly because the fruit is rarely seen in U.S. markets these days, despite its likeness to the apples and pears that overflow grocery bins. 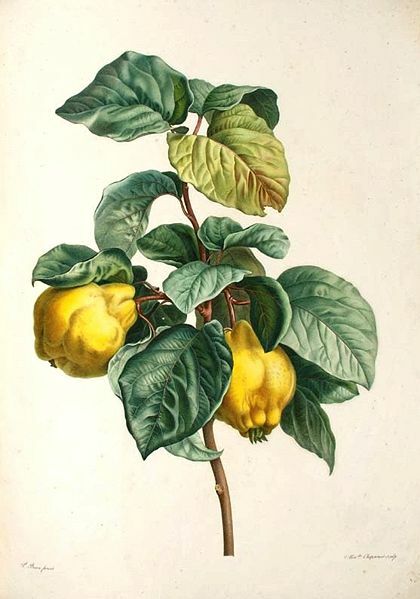 That very scarcity, coupled with the fact that quinces have a dry, astringent flesh that needs to be cooked, and so can’t be eaten out of hand like their more alluringly juicy cousins, might explain why the fruit isn’t a part of our typical repertoire, even though quince trees are still abundant – and abundantly ignored – around the country. A tasting of quince jam, served on a cracker with a bit of cheese at the greenmarket, persuaded me to pick up a few of these fall fruits. After all, cheese and quince paste (in a form somewhere between a dense jelly and fruit leather) are a classic pairing in Spanish cuisine. (I’ve even been known to serve some cheese and quince paste on matzo for a tapas meal served during Passover.) And the idea of cooking up a quick jam or compote that could accompany a meal of roast meats and vegetables, or be utilized for dessert in a tart of pastry, seemed appealing. A browse through The Foods & Wines of Spain, by Penelope Casas (Knopf, 1982) turned up a version of the jam, and Banda de Almendra (Almond and Marmalade Puff Pastry Strips),which would take advantage of some puff pastry in the freezer. The quince (membrillo) marmalade cooks up in no time, and a little bit tops puff pastry strips, sprinkled in this case with some chopped leftover walnuts. A Spanish-born sampler recognized them immediately: “Ah, membrillo!” After he relayed that they also known as Corbatas (“ties”), a batch was obligingly shaped into neckties.